It’s the Martian Manhunter’s worst nightmare! A rash of unexpected deaths have thrown the delicately maintained balance out of the population count of Liria. This forces them to call Nano back “home”, but since he was bred to be a Starfleet member he has trouble connecting to the group conscious. However, it’s the group unconscious that is the problem, as it is responsible for their own pyrokinetic abilities killing them. So instead of leaving Starfleet Nano is chosen (happily for him) to remain with the Enterprise and bring back his experiences with the unknown so his people can learn to overcome their fears. What they got right: The concept alone is fascinating as the writers get to explore a race they created. It’s a good exploration of Nano as an outsider by design struggling to connect to the telepathic group mind and as deep an exploration of the group consciousness and subconsciousness as a one-issue comic of the time had room to explore, just focusing on the threat of the subconscious fears the planet shares due to their culture. We get to learn more about the Lirin in general and Nano himself. What they got wrong: There’s kind of a forced connection between Mohindas and Nano as her father was part of the first contact, and she starts feeling sad that this inadvertently led to Nano being born an outsider to his own people, while at the end it’s more like Nano credits his life to her father. It’s not a bad idea but the subplot eventually goes nowhere since there isn’t any time to explore a character moment that ultimately had no effect on anything. 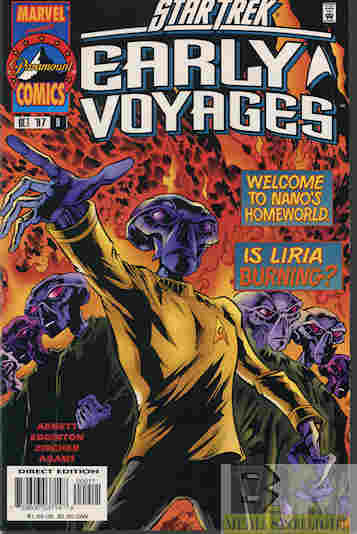 I also find it hard to believe that as friends Nano never knew her father was part of the first contact team to Liria. Recommendation: A fine story and a good example of Star Trek without the need for a huge budget. Highly recommended. Posted by ShadowWing Tronix on March 20, 2019 in Television Spotlight, Yesterday's Comics and tagged Christopher Pike, Lieutenant Nano, Lieutenant Sita Mohindas, Marvel Comics, Paramount Comics, Star Trek: Early Voyages.